PPC and the JP21 Foundation yesterday officially handed over a concrete practice and match cricket pitch to the children and teachers at Spine View Primary School in Rocklands, Mitchell’s plain. The JP21 Foundation was founded by cricketing legend JP Duminy to nurture grassroots cricket talent in the country, particularly in disadvantaged schools. When PPC acquired naming rights for the iconic Newlands cricket grounds it also announced it would partner with the JP21 Foundation by providing the readymix concrete for the pitches. Wicomb emphasises that the project is very much a community-focused enterprise. Local contractors were used in the construction of the pitches, and the pitches will also be used for children from outside the school who play in the JP21 Project League. The pitches will thus be a community asset, contributing to social cohesiveness and improve quality of life, “and clear demonstration of what we mean by strength beyond the bag of cement,” adds Wicomb. The launch event included an interactive coaching clinic, as members of the JP21 Foundation and PPC joined in to show the children of the school just how much fun cricket is. 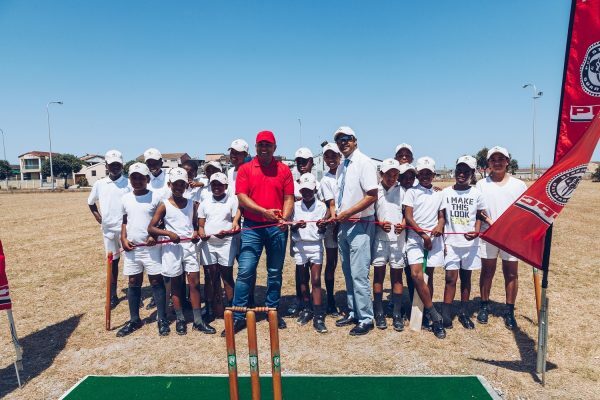 “We hope that these pitches – as we have handed about five pitches in Mitchell’s Plain over the recent past, will play a role in helping the children in these communities, which today includes Spine View Primary school learners, reach their individual potential while having a lot of fun. And, of course, we hope that we may yet see one or two of them striding onto the turf at PPC Newlands one day!” Wicomb concludes. A leading supplier of cement, lime and related products in southern Africa, PPC has 11 cement factories and a lime manufacturing facility in six African countries including South Africa, Botswana, DRC, Ethiopia, Rwanda and Zimbabwe. The commissioning of PPC’s milling depot, located in Harare, Zimbabwe and the completion of new integrated cement plants in the DRC and Ethiopia during 2017 bring PPC’s capacity to around eleven and a half million tons of cement per year, compared to 8 million tons in 2015. As part of its strategy and long-term vision, PPC is expanding its operations in South Africa with the modernisation of its PPC Slurry complex outside Mafikeng in the North West province. In April 2018 the new kiln, Slurry kiln 9 (SK9) was fired up for the first time marking a key milestone in the project. PPC Lime, located in the Northern Cape province of South Africa, is one of the largest lime producers in the southern hemisphere. It produces metallurgical-grade calcitic and dolomitic lime and sinter stone for use mainly in the steel and related industries. The acquisition of Pronto Holdings, consisting of Pronto Building Materials, Ulula Ash and 3Q Mahuma Concrete, has grown PPC’s footprint in the readymix sector to over 25 batching plants across South Africa and Mozambique and capacity to produce fly ash to half a million tons. PPC also produces aggregates in South Africa and Botswana. Follow PPC on Twitter //@PPC_Africa“>@PPC_Africa, like us on www.facebook.com/PPC.Cement and visit us at www.ppc.co.za.